Image obtained from scanning tunneling microscopy on a porous 3D-gold structure. Micro-supercapacitors are a promising alternative to micro-batteries because of their high power and long lifetime. They have been in development for about a decade but until now they have stored considerably less energy than micro-batteries, which has limited their application. Now researchers in the Laboratoire d’analyse et d’architecture des systèmes (LAAS-CNRS)1 in Toulouse and the INRS2 in Quebec have developed an electrode material that means electrochemical capacitors produce results similar to batteries, yet retain their particular advantages. This work was published on September 30, 2015 in Advanced Materials. With the development of on-board electronic systems3 and wireless technologies, the miniaturization of energy storage devices has become necessary. Micro-batteries are very widespread and store a large quantity of energy due to their chemical properties. However, they are affected by temperature variations and suffer from low electric power and limited lifetime (often around a few hundred charge/discharge cycles). By contrast, micro-supercapacitors have high power and theoretically infinite lifetime, but only store a low amount of energy. Micro-supercapacitors have been the subject of an increasing amount of research over the last ten years, but no concrete applications have come from it. Their lower energy density, i.e. the amount of energy that they can store in a given volume or surface area, has meant that they were not able to power sensors or microelectronic components. Researchers in the Intégration de systèmes de gestion de l’énergie team at LAAS-CNRS, in collaboration with the INRS of Quebec, have succeeded in removing this limitation by combining the best of micro-supercapacitors and micro-batteries. 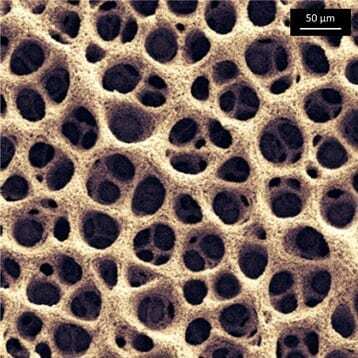 They have developed an electrode material whose energy density exceeds all the systems available to date. The electrode is made of an extremely porous gold structure into which ruthenium oxide has been inserted. It is synthesized using an electrochemical process. These expensive materials can be used here because the components are tiny: of the order of square millimeters. This electrode was used to make a micro-supercapacitor with energy density 0.5 J/cm², which is about 1000 times greater than existing micro-supercapacitors, and very similar to the density characteristics of current Li-ion micro-batteries. With this new energy density, their long lifetime, high power and tolerance to temperature variations, these micro-supercapacitors could finally be used in wearable, intelligent, on-board microsystems.